Polio - body, last, viral, contagious, causes, What Is Polio? Poliomyelitis (po-lee-o-my-uh-LYE-tis) is a condition caused by the polio virus that involves damage of nerve cells. It may lead to weakness and deterioration of the muscles and sometimes paralysis. Poliovirus, part of the enterovirus * group, makes its home in the gastrointestinal * tract, but when the viral infection spreads it can destroy nerve cells known as motor neurons, which make muscles work. The damaged motor neurons cannot rebuild themselves, and as a result the body's muscles no longer function correctly. * enterovirus (en-tuh-ro-W-rus) is a group of viruses that can infect the human gastrointestinal tract and spread through the body causing a number of symptoms. * brain stem is the part of the brain that carries messages back and forth between the higher areas of the brain and the spinal cord. Jonas Salk's vaccine containing dead, or inactive, poliovirus (IPV) is licensed, and mass numbers of school children are vaccinated, leading to an enormous decrease in the number of polio cases over the next few years and a 60 to 70 percent prevention rate. Albert Sabin's oral polio vaccine (OPV), containing a live but weakened virus, becomes the new recommended vaccination in the United States. It offers lifelong protection, can be swallowed, and is easy to administer; in very rare cases, however, it actually causes paralytic polio. The last cases of wild polio are reported in the United States. IPV becomes the exclusive polio vaccine used in the United States. Experts believe that because polio has virtually disappeared in the United States, the benefits of using OPV are no longer worth the very small risk of contracting the disease from OPV. Polio has been nearly wiped out worldwide. Because polio is no longer found in the United States, a doctor may ask about any recent travel to countries where the disease still occurs. A doctor may suspect polio in an ill patient with paralysis, particularly if the person has not been immunized against polio. During a physical examination, a doctor looks for evidence of muscle paralysis. Samples of blood, bowel movements, fluid from the throat, or cerebrospinal fluid * may be taken and tested for the virus. * urinary tract Infections, or UTIs, are infections that occur in any part of the urinary tract. The urinary tract is made up of the urethra, bladder, ureters, and kidneys. * ventilator (VEN-tuh-lay-ter) is a machine used to support or control a person's breathing. * kidney stones are hard structures that form in the urinary tract. These structures are composed of crystallized chemicals that have separated from the urine. They can obstruct the flow of urine and cause tissue damage and pain as the body attempts to pass the stones through the urinary tract and out of the body. The polio vaccine is the best way to prevent the disease; its use has eliminated polio from the Western Hemisphere. Jonas Salk developed the first vaccine in 1955. It is known as inactivated poliovirus vaccine (IPV), because the poliovirus used to make the vaccine was "killed," or inactivated. Several years later, Albert Sabin developed an oral polio vaccine, which was given in the form of drops that could be swallowed. These drops contained a live, but weakened, virus. 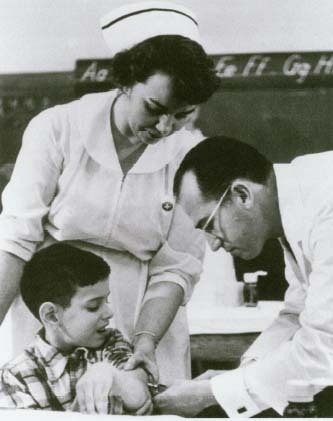 Dr. Jonas Salk started researching polio in 1949. In 1955, he announced the success of his polio vaccine, and mass immunization began. OPV was very successful in helping rid the United States of polio. Its advantage over IPV was that once children had been immunized, they could pass the weakened virus to others who had not received the vaccine in the same way that the infectious poliovirus spread between people. This contact with the virus gave unvaccinated children immunity as if they had been vaccinated. In rare cases, however, because it contained a live virus OPV actually caused paralytic polio in the children who received the vaccine or in people who had close contact with them and had not been immunized. This is known as vaccine-associated paralytic polio. People with weakened immune systems were most at risk for VAPP. IPV is now the only polio vaccine used in the United States, and it does not cause VAPP. Children might have a sore spot where they receive the shot, but there are rarely any side effects from the vaccine. Children receive IPV routinely as part of the childhood immunization schedule. Most adults who were vaccinated as children do not need to receive the vaccine again. People traveling to places where polio is still found (such as Africa and Asia), lab workers who handle poliovirus, and medical professionals who care for patients with polio may need to be vaccinated again. If polio is wiped out worldwide, immunization against polio may not be needed in the future. U.S. Centers for Disease Control and Prevention (CDC), 1600 Clifton Road, Atlanta, GA 30333. Through the website of the National Immunization Program, the CDC provides information about polio and immunization schedules and vaccines. KidsHealth.org . KidsHealth is a website created by the medical experts of the Nemours Foundation and is devoted to issues of children's health. It contains articles on a variety of health topics, including polio.